Scott Morris is the President of Passport Game Studios, a board game publisher based in the United States. He recently did a talk in Austin, Tx. about how to pitch your board game to publishers more effectively. Tabletop game designers looking to get picked up by a board game publisher were in attendance. I have known Scott for over 10 years now. Along with being a great friend, Scott is a very nice and helpful person. He uses his knowledge to help out our tabletop game design community by giving talks such as these.. The following is a detailed outline from notes that were taken at Scott’s talk about the game designer to board game publisher relationship. Along with notes I added about my viewpoints on the topics. As a game designer pitching your board game to a publisher, it’s very important to research a publishers needs. Your odds of success getting published are much higher when you know a publisher needs your game. I also want to stress that the common answer you will get when pitching your game is “no.” Publishers will usually be nicer about it than that. But just know that it’s ok if the first several (or 30!) publishers tell you they can’t publish your game. It’s probably because your game doesn’t fit their portfolio (needs). 1b. How do you know who a good publisher is? Here are 4 questions you can ask yourself when researching a board game publisher that you are wanting to pitch your game to. Do they have multiple successful games? Does their portfolio have different types of successful games? Do they have a lot of connections? You will want a publisher who can connect you with others. This will also help market your game. Finding the answers to these questions will give you a better sense of whether the publisher is good or not. While the board game industry is growing, there are still not that many successful board game publishers out there. Remember that they all talk to one another and share ideas. This can be both a good and a bad thing. It’s good in that board game publishers can potentially help you find a different publisher that needs a game of your type. And it can be bad if you have a fallout with one publisher because they all talk to one another. But assuming you are a nice and helpful person, the size of the board game publishing industry should be a good thing. This term is commonly used in the board game publishing industry and are games that they don’t like to produce. It makes sense because as a business, a board game publisher wants games that will continue to bring in money over time. Not a game that looks awesome at first but then goes away. A game with great artwork but with boring (or broken) game play is the perfect recipe for a firework game for example. A publisher will typically ask you “What do you know about me?” And a lot of time the game designer will not know. They wouldn’t have done their research. And 99% of the time the publishers answer to those questions is “no”. The biggest problem with statements like the ones above is that there is no hook. A good hook will capture the publishers attention and give them a reason to want to look into your game. The most important takeaway is to get inside the head of the publisher and tell them why your board game would help round out their portfolio. They will be much more likely to listen to your pitch or send you to another publisher that would be interested in your type of tabletop game if you just take the time to know a little bit about who the publisher is. Here is an example of a line about the game Sheriff of Nottingham. The League of Gamemakers have a really good article on making a great sell sheet for your board game. You can see it with a lot of examples of sell sheets they provided here. Publishers are typically booked out months in advance before conventions. They might be willing to take your sell sheet but make sure it’s solid so that you don’t waste their time. You want a great first impression. Have a sell sheet (or 2 or 3) with you. Don’t forget this! Your game may not fill a need that they have. However, they do know most other board game publishers and could pass your info (sell sheet) on to a friend or 2. Be polite. Because again, even if they pass on your game they may know a fellow publisher that is looking for a board game like yours to fill their need. These are important to the publisher because of the relationships that you will build with their audience (and them) if they decide to publish your board game. Let’s start with the first part of this statement. “Stay true to yourself”. It’s important in many things in life to just be you. This is no different in the board game design world. Now this sounds easy but when you are pitching your board game to a publisher, all sorts of emotions will likely come up. Especially if you are naturally a shy person like myself. So do your best and just be yourself. And now let’s talk about the second half of this statement, “don’t get married to everything in your game”. Being flexible and finding a board game publisher that you like and trust is important. It is very common to have publishers suggest/request changes that should be made to your game. They make these points based on their years of being in the business and it might not always be intuitive. However, you don’t have to say “yes” or “no” to the changes board game publishers suggest immediately. Scott says it’s great to ask questions and for both you (the designer) and them (the publisher) to agree on the changes. Even if agreeing means compromising. How will this change help my game? How will this change help me? And simply asking why they are suggesting the changes can be helpful. Getting inside the publishers head and reasons behind their changes will provide you clarity while also building your relationship with them. Both good and bad things will happen to you and your game through the publishing process. Having a great relationship with your publisher will help you make it through the difficult times and get your game made. Publishers work directly with board game retailers very often. And Scott pointed out that retailers love having videos to show customers. But both retailers and publishers don’t have a lot of spare time to make videos of all of the board games they are selling. So it helps make a great impression to your potential publisher if you already have a cool video or 2 about your board game. Here are a couple of the most common types of videos you could create for your board game. While this isn’t required, it does help you stand out from all of the other board game designers pitching their games to publishers. But this is not an easy task to take on so don’t feel bad if you didn’t do this before pitching to a publisher. The first thing to do is to look over the contract. Line by line go through the offer that the publisher has sent you. Scott says hiring a lawyer is very valuable for you as a game designer, even if the publisher is your best friend. Build a good reputation (personal brand) for yourself in the board game industry. And to go with that, Scott suggested to not say anything online that you can’t follow up with a high five. Remember that this industry is small and most of the publishers talk with each other. If you ruin your reputation with one of them then you may ruin your chances with all of them. So be professional and polite to both publishers and fans alike. There is not a board game in the world that doesn’t have people hating at least something about it. So when you have people posting terrible comments about your game, remember that your reputation is much more valuable than their opinion. Don’t let their opinion cause you to lose reputation. Instead you could read their comments, try to learn from it and move on. Scott opened the floor to questions at the end of his talk. Here are some of the questions that board game designers asked along with other frequently asked questions Scott receives as a board game publisher. 4a. Should I worry about my game idea being stolen? Be professional when showing your game. Ideas aren’t usually stolen because it’s quite time consuming to go from game concept to shelf. Be careful and professional when showing your game. Just don’t overthink it. And most of the forums and articles I read say the same thing. People won’t steal your board game idea in general because there is not much upside to it. The ideas are only about 5% of the work that goes into making a board game. Even when you act on that brilliant idea, it’s much less likely to make you money than most anything else a criminal would want to steal. I’m not saying board game ideas are never stolen, but it’s just highly unlikely and much more likely just an excuse for you to not make your own game. One of the biggest milestones I see board game designers make is going from idea to prototype. Which is why I made videos teaching game designers how to use this awesome free software to make their prototypes. 4b. Should I stop my Kickstarter for a publisher if they come to me? First figure out if that is something you want to do. And if you think it would be helpful for your board game to go through a publisher, then you should research the publisher. Check to make sure there are no red flags with the publisher (see what games they have published and how professional they look/sound). Scott noted that some board game publishers will want you to finish your Kickstarter and then help you sell the rest of the board games in your print run that weren’t sold through the Kickstarter. For example, you might have sold 600 copies of your game through your Kickstarter but had 1000 copies printed to make it more cost effective. A board game publisher can help you market and sell the remaining 400 copies of your board game. Pretty cool deal if you ask me! 4c. Will I make money at gaming conventions selling my board game? You will not typically make money at gaming conventions. Publishers and other vendors use conventions more for marketing their board games and networking with fans and other vendors. It is very common to lose money up front when attending conventions. But the goal should be to gain loyal fans and bring customers value. 4d. Who are the top 5 big board game distributors in the industry (USA)? I want to thank Scott Morris so much for speaking at this meetup in Austin for board game designers. 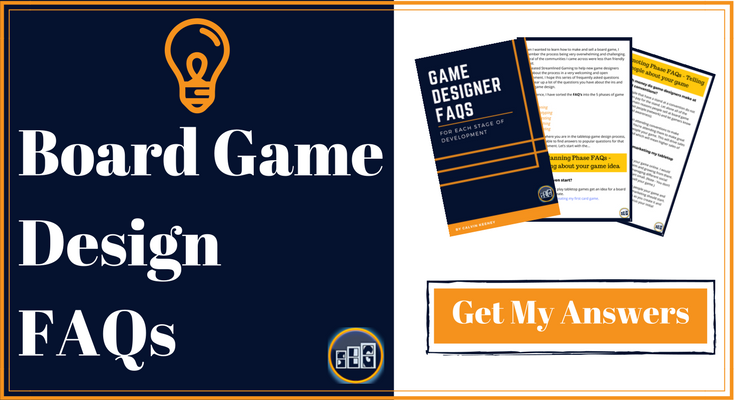 This information was so valuable and I hope you found answers to some of your questions you had about board game publishing. If you know any other cool tips and tricks when it comes to getting your board game published, please let everyone know in the comments below. It’s nice to learn from one another. Great read! Thank you for putting all this together!